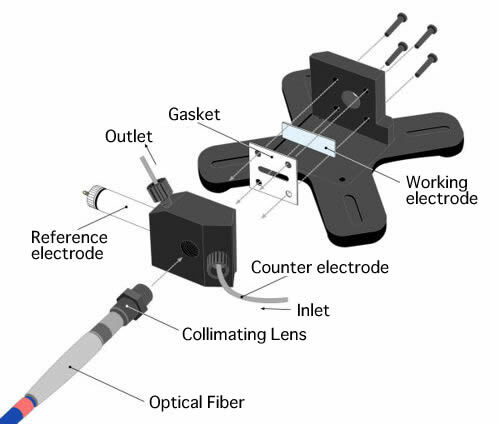 Using the spectroelectrochemical flow cell, it is possible to have a different optical path length changing the gasket. We offer, as an optional item, a silicon and Teflon gasket with a 100, 250 and 500 µm of the thickness. 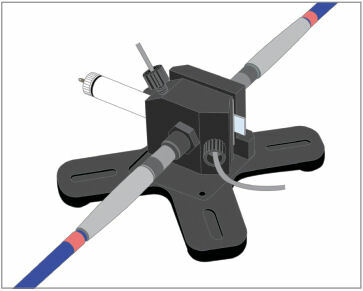 SEC-2F Spectroelectrochemical flow cell was designed to fit perfectly in the SEC2000 Spectrometer, and it eliminated the use of the optical fiber to connect the Spectrometer to the SEC-2F. 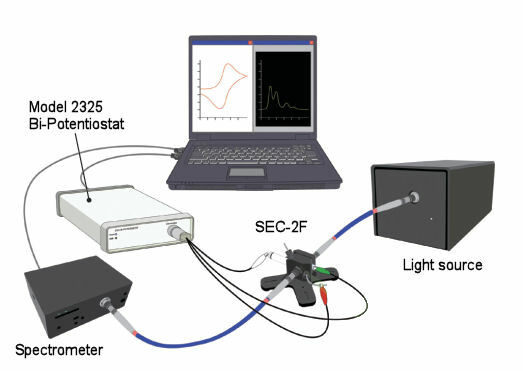 Even for another brand of the spectrometer, you can connect the SEC-2F using the collimating lens and optical fiber. ∗ collimating lens, optical fiber and reference electrode are not included in the kit. For the system set-up, spectrometer (detector), light source, optical fiber, electrochemical analyzer, spectroelectrochemical flow cell, the liquid feed pump (or syringe), and the PC for data processing are required. ITO electrode or platinum, gold or carbon grid electrode could be used as a working electrode. 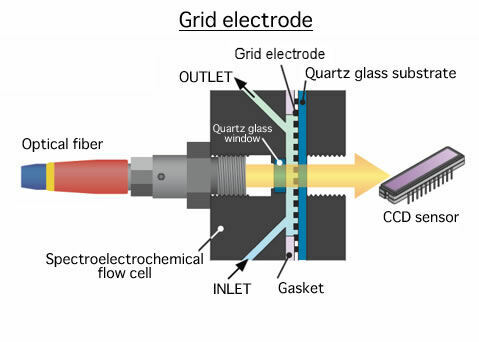 Grid type electrode and ITO electrode are using in the spectroelectrochemical flow cell. Grid electrode or ITO electrode, it is setting in the side where the light is transmitted through it. Light is irradiated to the working electrode, using the optical fiber connected to the light source. The changes in the concentration of the reactants on the surface of electrode, as in a electrolysis reaction, will consequently change the spectrum transmission for the component. The change of transmission light quantity can be detected by CCD array detector. Schematic structure is shown below. 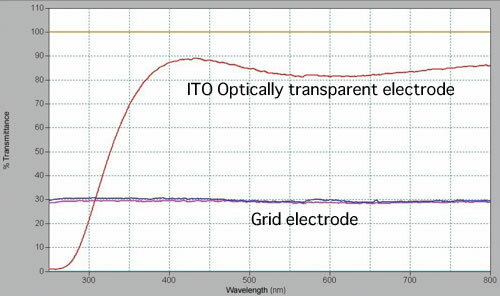 The light transmittance was compared with ITO electrode and Grid electrode (Au, Pt and Carbon) on a quartz glass as a reference. 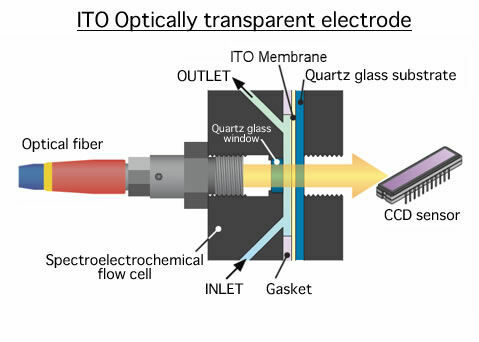 For ITO electrode the light cannot be transmitted easily in an ultraviolet range. The transmittance is about 10% at 280 nm of the wavelength. For wavelength above 400 nm the transmittance is above 80%. Compared with the quartz glass, the light transmission for grid electrode is about 30%, however it could be used in an ultraviolet range. Reference data:The light transmittance is 50 ∼55% for SEC-C Platinum mesh electrode. ●Handling of the thinner gasket is complicated. When you use a thin gasket, please pay attention with the flow rate. ●For the light source type, one piece for SEC2000-TH (SEC2000-VIS / NIR) and two pieces for SEC2000-DH (SEC2000-UV / VIS) are required. 100, 250 and 500 µm thickness gasket. At the left diagram, the characteristic absorption peak of the sample is enclosed at a red line. 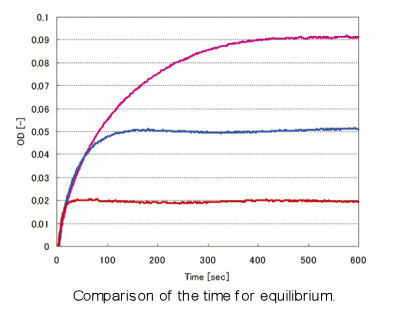 At the right diagram, the equilimbrium time for electrolysis is shown. 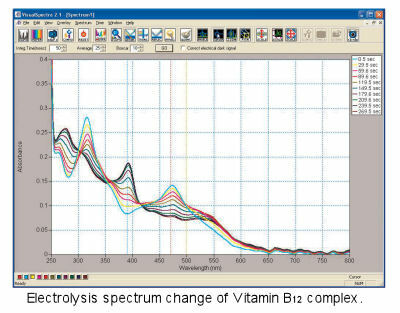 Electrolysis of Vitamin B12 derived complex. 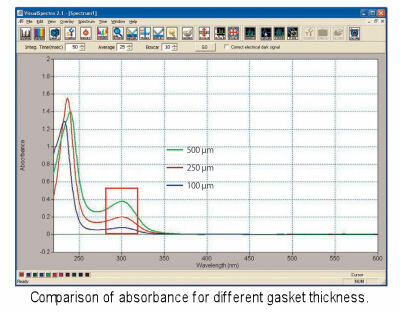 The 250 µm gasket was used for the moritoring of the electrolysis spectrum of the vitamin B12 complex.